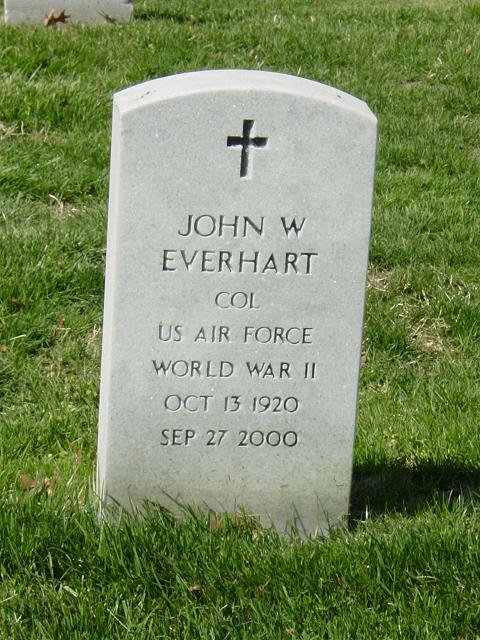 John William Everhart, 79, a retired Air Force Colonel and Energy Department Engineer, died of cancer September 27, 2000, at George Washington University Hospital. He lived in Arlington, Virginia. Colonel Everhart was a native of Lovettsville, Virginia, who graduated from the Lovettsville School and Virginia Tech. He received a master's degree in engineering education from the Air Force Institute of Technology in Ohio. He also studied systems management at the University of California. Colonel Everhart served in the Army in the Pacific and Europe during World War II. He continued his military service in the Air Force in Germany, Wyoming, California and Ohio, where he was director for the Air Force of major space systems facilities. After he retired in 1964, he was an engineering consultant. He later managed engineering and physics research projects for the Energy Department, and he retired in 1995 from the department's office of energy research. His honors included three Air Force Commendation Medals. He was a member of the Society of American Military Engineers, Air Force Association, St. Peter's Episcopal Church in Arlington and Washington Golf and Country Club. His interests included golf and hunting. His first wife, Elizabeth Brower Everhart, died in 1977, and his second wife, Nancy Shaw Everhart, died in 1995. Survivors include his wife, Jane B. Everhart of Arlington; three sons from his first marriage, John R. Everhart of Annapolis, Robert K. Everhart of Lovettsville and Ronald S. Everhart of Kihei, Hawaii; and three grandchildren.